When it was released in 1897, Dracula was praised as “the sensation of the season” and “the most blood-curdling novel of the paralysed century”. 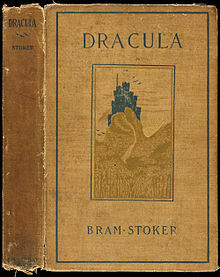 114 years later and Count Dracula continues to haunt modern readers both in Stoker’s original words and as the forefather of a whole sub-genre. You don’t need to me to tell you that, even if the vampire craze wasn’t what it is, you should read this book. Jonathan Harker, a newly-qualified and fresh-faced solicitor, flits off to Transylvania to take the instructions of the mysterious Count Dracula. Unsurprisingly, things turn out to not be quite as they seem for poor Mr Harker. Some time later, shadows start shifting in England when a ship manned only by a corpse is wrecked in Whitby, a beautiful young woman finds herself haunted by night terrors and discovers strange puncture marks on her neck and the inmate of a lunatic asylum builds himself into a frenzy raving about the arrival of the ‘Master’ and his steady approach. As you might expect, this book is creepy. Not in a blood-and-gore-everywhere-women-screaming kind of way but in a subtle, building way that will leave you checking over your shoulder while out in the dark even though you have no idea why. It is a fine example of everything that makes Gothic literature so appealing – thunderstorms over great, looming asylums for the insane, the sound of howling wolves carried on the wind, mysterious castles and a good amount of hanging around in graveyards. My favourite thing about the book? The fact that no detail, no matter how seemingly incidental, is superfluous. After the story moved back to England, Stoker spends a lot of time building up his characters and ‘setting the scene’. Renfield is a perfect example. Unsettling though the ramblings of a ‘lunatic’ no doubt are, there doesn’t appear to be much point to the man who eats flies and rambles on. He’s a great distraction for Dr John Seward, of course, but didn’t appear to be much more than that. How wrong I was! Likewise Lucy’s suitors. Even though their wanton proposals of marriage did irritate me (see later mini-rant…), Lucy’s descriptions of them serve as a brilliant introduction to Quincey Morris, Arthur Holmwood and Dr Seward. I loved pretty much all of the main characters of Dracula. Mina Murray is a fantastic female character, especially considering the time in which she was written. She’s smart, feisty, devoted and witty. Most importantly, she doesn’t simper or faint. She may be pretty too (I seem to remember her being so described at some point…). The band of unlikely heroes (Quincey Morris, Arthur Holmwood, Dr Seward and Dr Van Helsing) are also great. My undisputed favourite was John Seward for his sensitivity, respect (mostly) in his dealings with Renfield and his selflessness. Quincey Morris is a close second for just being so refreshingly gung-ho about vampire chasing! The least appealing aspect of the book for me was a small one but one that grated on my nerves more than once: how fervently everybody seemed to love Lucy. For some unusual reason, three men propose to her on one day. My guess is that we’re supposed to be being shown how wonderful she is so that later events have more impact. Possibly also as a way of binding the characters more tightly together. For me, though, the abundant declarations of love were unnecessary. The characters were strong enough without them. Oh, and perhaps I could have had one or two less of Van Helsing’s speeches on science, morals, history etc. His ‘voice’ is occasionally tough to read because he’s Dutch and his letters/diary entries etc are written authentically in a Dutch-man-speaking/writing-English structure and tone. It is endearing, in a way, but also hard work. Bear with him! I couldn’t write anything about this book, either, without mentioning the obviously incredible atmosphere. There’s a constant feeling that something is lingering around the corner and Stoker writes gloomy, windswept and haunting vistas like nobody I’ve ever read. It helps that I visited Whitby only a couple of months ago and had walked up to the Abbey visited regularly by Mina and Lucy and remember saying how desolate it must be in the winter (let’s ignore the fact that it was sunny for the time being…) It made it easier to imagine a lot of the scenes there and added an extra layer of disturbing realism.